Parts with 2 colors or having a transparent portion and an opaque portion. 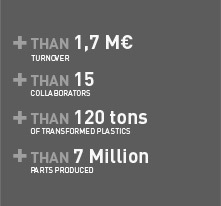 The technology used by OPS Plastique is suitable for small and medium series. It reduces the cost of molds and thus makes this technology affordable to many new markets. The fleet of presses is adapted to this technology with presses from 50 to 250 tons.